In this post, I am going to talk about Copper. Copper is a transition metal and one of the properties of transition metals is that it forms compounds of different colours. Copper is especially popular among examiners because of the large number of colours it’s compound exists as! Let’s take a quick look at what they are! If you look at the image above, there are 4 different colours and 5 different element/compounds. A – Copper metal. Copper metal is a reddish brown solid. B – Copper(II) carbonate is a green solid/powder. D – Copper(II) oxide is a black solid. 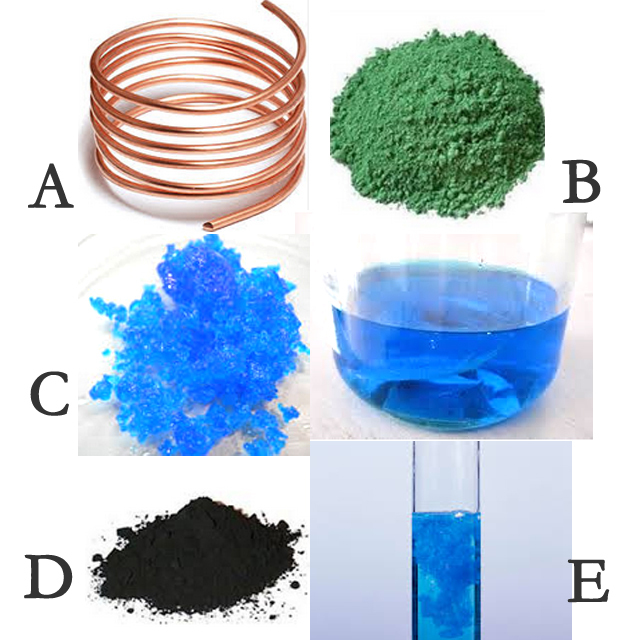 E – Copper(II) hydroxide is a blue precipitate. I hope this very short post has helped you get your colours right! All the best for your O level chemistry exam!